Russell Golman is an Assistant Professor of Behavioral Economics and Decision Sciences in the Social & Decision Sciences Department at CMU. His pioneering, interdisciplinary work has been published in a wide range of academic journals, including Science Advances, Decision, the RAND Journal of Economics, the Journal of Economic Theory, the Journal of Economic Perspectives, and the Journal of Economic Literature. In 2017 Professor Golman organized the Belief-Based Utility Conference at Carnegie Mellon with generous funding from the Russell Sloan Foundation and the Alfred P. Sloan Foundation. Professor Golman combines economics, psychology, and mathematics to develop theories about why people (and societies) make the choices they make. His landmark behavioral decision research on the topic of belief-based utility offers new insights about when people will actively avoid useful information or be driven by curiosity to obtain useless information and when they will find uncertainty to be exciting or to be uncomfortable. His behavioral game theory research provides a new understanding of the process of strategic deliberation, offering better predictions of one-shot play across a range of games as well as new predictions about response time patterns and time pressure effects. His research on complex social dynamics shows how social actors (humans, firms, or even social insects) gather information from each other in order to innovate and generate novelty, outside of equilibrium. Golman, Russell and George Loewenstein. “Information Gaps: A Theory of Preferences Regarding the Presence and Absence of Information” Decision, 2016, forthcoming. Golman, Russell, David Hagmann, and George Loewenstein. “Information Avoidance.” Journal of Economic Literature, 2017, 55: 96-135. Golman, Russell, George Loewenstein, Karl Ove Moene and Luca Zarri. “The Preference for Belief Consonance.” Journal of Economic Perspectives 2016, 30: 165-187. Golman, Russell and Steven Klepper. “Spinoffs and Clustering.” Rand Journal of Economics 2016, 47: 341-365. Golman, Russell, David Hagmann and John Miller. “Polya’s Bees: A Model of Decentralized Decision Making.” Science Advances 1 (2015). 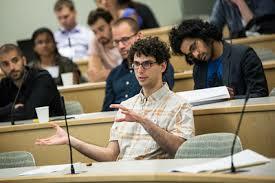 How Did a Mathematician Become a Professor of Behavioral Economics and Decision Sciences? Professor Golman was trained as a game theorist with a Mathematics Ph.D. from the University of Michigan. But whereas game theorists usually assume that people making strategic decisions are hyper-rational, Russell wanted to acknowledge that real people are influenced by each other and sometimes make mistakes. They often care deeply about their beliefs, not just about material outcomes. And they rarely settle into an equilibrium in which everybody is static and content. Russell’s research interests expanded into behavioral economics and behavioral decision research as well as complex adaptive systems and social dynamics. He took a postdoc in Social and Decision Sciences at CMU, where Herb Simon first conceived of the concept of bounded rationality 50 years earlier. Professor Golman joined the faculty here in 2012. University of Michigan, Applied & Interdisciplinary Mathematics, Ph.D.